Banijay Group’s Screentime ShinAwiL has been sold back to the Irish prodco’s management. CEO Larry Bass has taken 100% control after a mutually-agreed share buyback. Further to that, the firm will revert to its original name, ShinAwiL. Banijay International will continue selling ShinAwiL programming internationally, with the prodco continuing to sell Banijay formats in Ireland. Screentime ShinAwiL was formed in 2003 as a joint venture between Bass and Australian producer Screentime following the production of Irish format Popstars. Banijay then bought Screentime in 2012, bringing both the Irish and Australian firms under its wing. “We have had a great working partnership with Screentime since 2003 and with Banijay for the last few years,” said ShinAwiL CEO Bass. “We look forward to building on this relationship with coproductions in the future. Banijay Group CEO Marco Bassetti said he was “pleased to continue our successful distribution agreement with ShinAwiL in Ireland and look forward to announcing further mutually rewarding productions in the coming months”. ShinAwiL currently produces Banijay formats Home of the Year and tested on Humans for Irish pubcaster RTÉ. 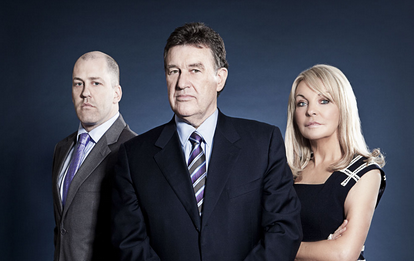 It also produces the Irish versions of international formats such as The Apprentice (pictured).